R Aquarii is a symbiotic star believed to contain a white dwarf and a Mira-type variable in a binary system. The main Mira-type star is a red giant, and varies in brightness by a factor of several hundred and with a period of slightly more than a year; this variability has been discovered by Karl Ludwig Harding in 1810. By its gravitational pull, the white dwarf draws in material from the red giant and occasionally ejects some of the surplus in the weird loops to form the nebula seen in our image. The whole system appears reddened because it is situated in a very dusty region of space, and its blue light is absorbed before reaching us. The nebula around R Aquarii is also known as Cederblad 211. According to Tom Polakis (Astronomy Vol. 26, No. 10 (Oct 1998), p. 83), at that time, noone had succeeded to observe this challenging object visually. It is possible that the nebula is the remnant of a nova-like outburst, which may have been observed by Japanese astronomers, in the year 930 AD. 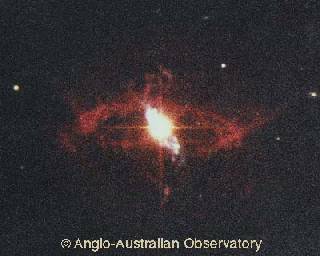 Our image of R Aquarii was obtained by David Malin and is copyrighted © Australian Astronomical Observatory.